Commercial Grade Gelcoat/Fiberglass Shower Pan. 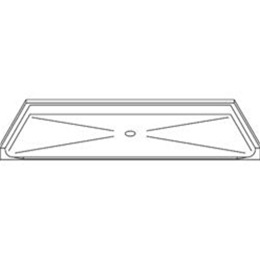 This shower pan complies with California Title 24 inside dimensions of 60" x 30" and 2% slope for roll-in showers. Luxurious polyester Gelcoat finish in solid colors. Accessories available: shower valve, matching soap dish, glide bar/hand shower, curtain and rod. Contact your sales representative for more information. Dimensions: 63" x 34" x 5"